More specifically, how about some pie? Apple? With caramel sauce and ice cream? I used local Fuji apples, and they were so juicy and delicious! 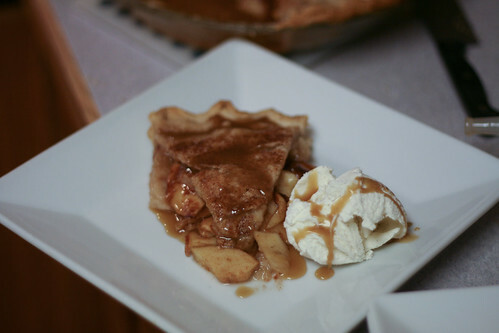 I’m going to do this again, because this was seriously the best apple pie, but I’m going to use Granny Smith, cause that’s what I’ve got. It’s gonna work, don’t worry. I also didn’t follow a recipe. It was probably the wildest thing I’ve ever done. Don’t make fun of me. There’s no feeling like the pounding in your heart when you have no guarantee that the pie you’re making could be epic or awful. I also used cinnamon chips, and I think I need to have them permanently stocked in my pantry. You should too. What can’t you use them for? I ALSO LEARNED THE COOLEST TRICK!! Sorry for yelling, but this tip changed my life. For real. 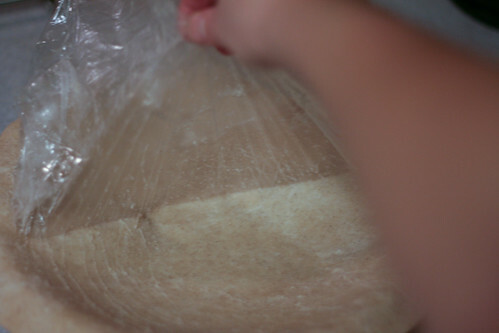 Instead of crying over flour and mangled pie crust, roll it between two sheets of plastic wrap. flip it over onto a pie plate, and peel off the other layer! I took the decadence an extra step this time and brushed the top crust with butter, and then sprinkled it with cinnamon sugar. Clearly I’ve made no New Year’s Resolutions. Cut butter into small cubes and freeze for 15 minutes. 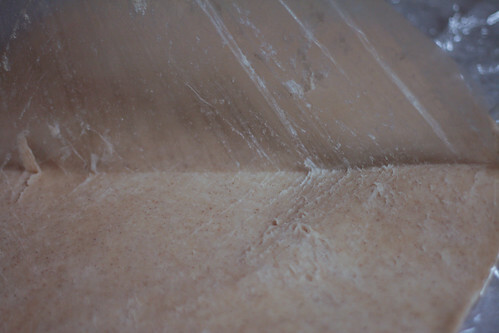 Combine flour, salt, sugar and cinnamon in a bowl, then add the very cold butter and combine with a pastry cutter until it looks like coarse sand. Sprinkle ice water over the mixture and press the dough together with a rubber spatula. Eventually you will be able to pinch the dough together and have it stick to itself. 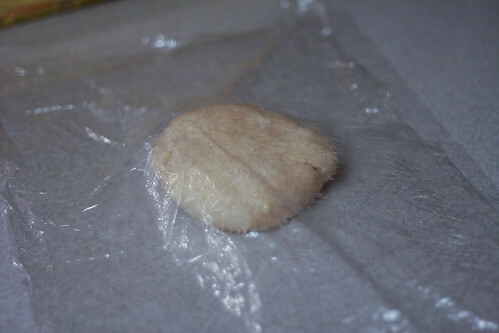 Divide the dough in half, press into round disks and cover in plastic wrap. 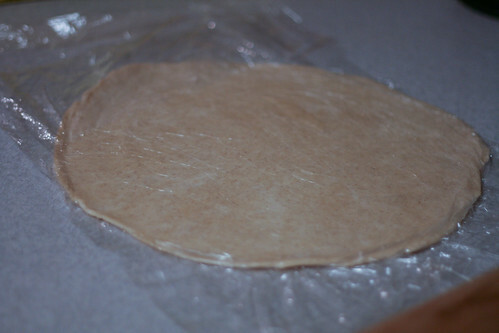 Refrigerate the dough for at least an hour, and up to a day. 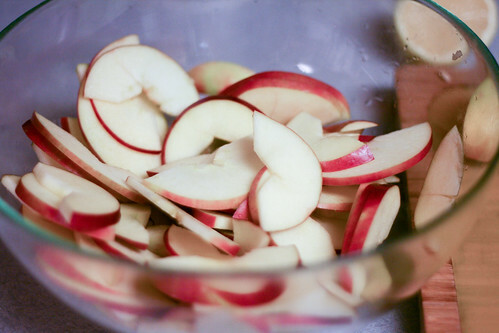 Slice the apples very thinly, and then add the apple slices and lemon juice together in a large bowl. Make sure all the apple slices get covered in the lemon juice. 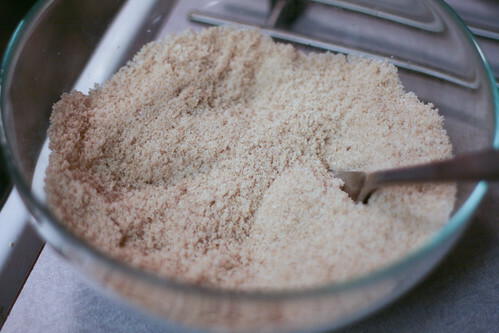 In a separate bowl, whisk the sugar, brown sugar, nutmeg and cornstarch together. Add the cinnamon chips and stir them in. 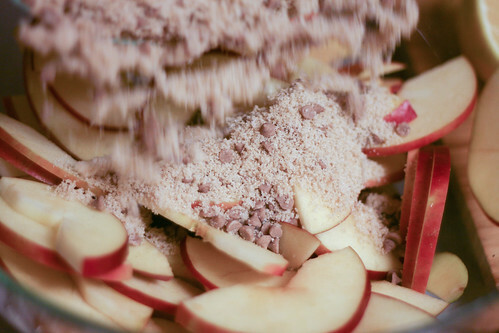 Add the sugar mixture to the apple slices, and make sure the apples get coated in the sugar mixture. 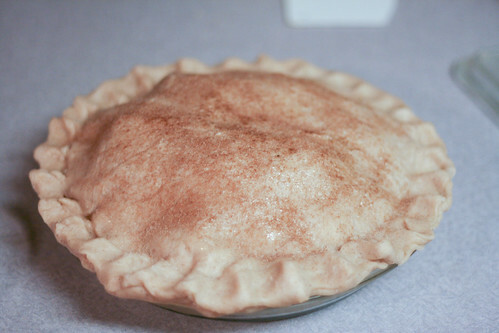 Roll out the first pie crust (see above for rolling instructions, or use a well floured surface), and gently put it in a pie pan. Pour the apple filling into it, and then roll out the next crust. 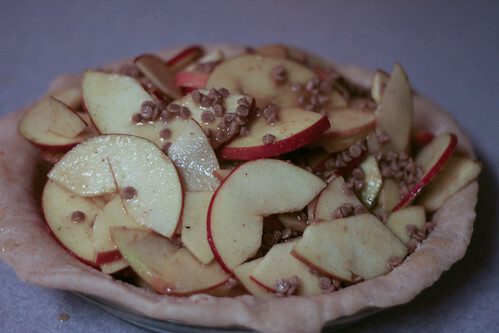 Lay the second crust over the apple mixture, and pinch together and trim the edges. 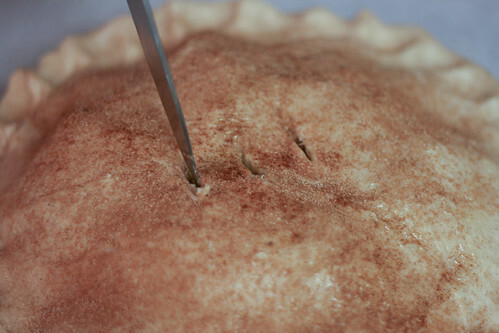 Cut vents in the top of the pie, and brush with butter. 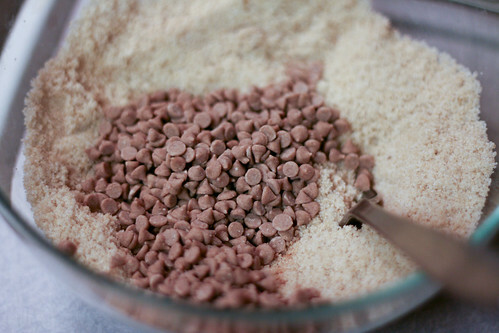 Sprinkle with cinnamon sugar, if desired. Bake for 45-50 minutes. If the edges look like they’re starting to burn, wrap them with foil. 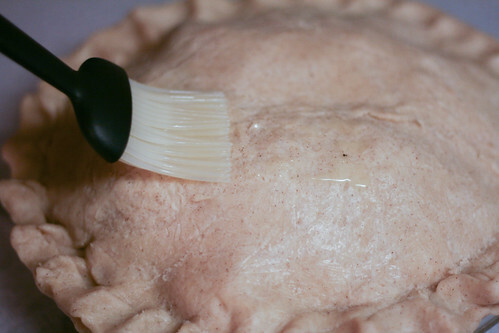 Allow the pie to cool for 1-2 hours before serving. 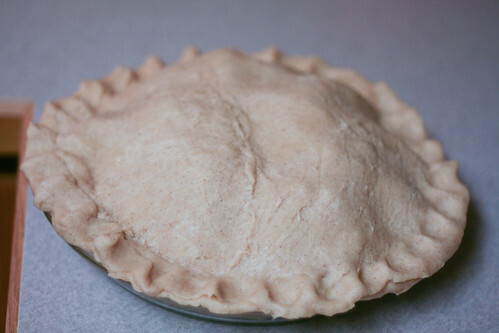 If you’re very very hungry for pie, you can put it in the refrigerator for half an hour before serving. Just don’t melt your refrigerator shelf. 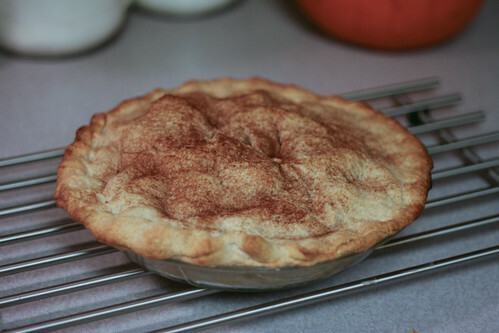 I made apple pie last week and wish I would have known about the plastic wrap trick. An epic struggle between myself and the pie crust ensued. While I was eventually victorious, it the battle nearly defeated me and I almost left the kitchen never to return. Previous Previous post: Be a Good Cookie — Winner!